Like a V8 drive? German made? Yep, join the club. This is Europe’s best luxo-liner. In true seven-series fashion, the new BMW 740i has loads of grunt under the hood, a superbly taut and comfortable chassis, colossal grip and luxury fit for a king. The slightly smaller, lighter engine means that the 740 i is the frugal seven series variant. Modern man demands a clean, green driving machine. Where can you purchase such an item? Well it is without a doubt, that Europe leads the world in low carbon emitting engine design. 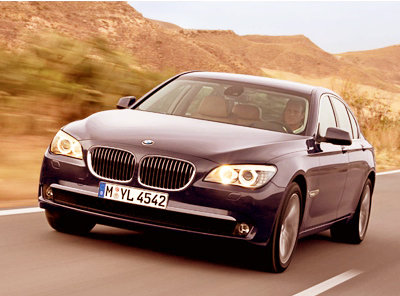 The very fuel efficient, clean burning BMW 740i is a wonderfully smooth hi-tech engine that breathes very purely. The in line six-cylinder engine has the familiar smooth 24-valve design, but boasts a highly commendable up-to-date, and class leading, combined average fuel consumption of well under 9 Litres/100 km. This figure is amazing when placed into context. The BMW 740i is a big car, and weighs in at 1860 kg. The big 740i sedan has a length of 5072 mm. However if you opt for the longer 740Li model, the increase throws the rear end out to 5212 mm. I’m not sure whether the L stands for Long wheel base or Limousine. Both would be adequate expressions. BMW’s should offer something a little special when it comes to high speed performance. The new BMW 740i sedan does not disappoint. There is a thumping 240 kW of power at 5800 rpm. Open the engine out to 5800 rpm and the smooth acting engine pushes you firmly into your seats. The maximum 450 Nm torque figure kicks in at a knockout 1500 rpm. Oh so low! The creamy thrust is incredibly addictive. Whether you like to drive sedately along the motorway or whether you need to push on you will most definitely experience the big Beemer’s handling prowess first hand. Precision fit and finish is understandably first rate. Don’t go looking elsewhere for higher-end luxury. You simply won’t find it. The BMW 740 i and BMW 740 Li offer incredible refinement and incredibly comfortable seating for five large adults. The interior is so nicely crafted that it begs me to use plenty of superlatives here. Tasteful colours and wooden and aluminium inserts create an interior that you can individualise for your own unique tastes. Your touch senses will be tantalized by the silk-quality materials used inside the 740i sedan. Reclining seats with memory functions make your journey a sublime experience. All the luxury items will be there as standard. BMW seven-series ergonomics astounds at the ease with which switchgear and instrumentation can be reached. Generous space, clear-cut elegance and charming style form the warm ambience and pleasant character of the BMW 740i and Li interior. The 740i cockpit has an eye-catching design that features an alluring instrument cluster with black panel technology. When not in use, the display is matt black. The instrument cluster comes to life in several stages when the ignition is started. Elegant white on black lettering makes the speedometer and tachometer very clear. A nice looking multifunctional steering will always be nice to hold. Imposing at the front, powerful at the rear, the BMW 740i and 740Li sedans offer an imposing presence on the road. Enjoy this dream machine for real. For any more information on the BMW 740 i, or for that matter any other new car, contact one of our friendly consultants on 1300 303 181. If you’d like some fleet discount pricing (yes even for private buyers! ), we can submit vehicle quote requests out to our national network of BMW dealers and come back with pricing within 24 hours. Private Fleet – car buying made easy!